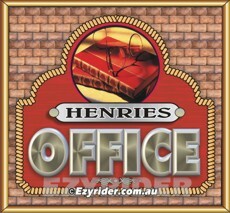 ﻿ Office Designs, Signs, Graphics - Pictures & Information. 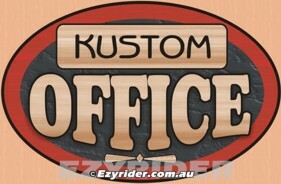 The below designs shows specifically some "Office" design ideas for personalizing. Please contact me if you require any other specialised custom made sign. For full particulars on how to contact and order any produce please clink on link 'Contact & Ordering'. These exterior quality timber engraved signs are deep engraved into Cedar. The top edge is bevelled, painted black with the edge also. The letters are raised with the background cut away to a rustic finish, and painted black, leaving the letters a natural timber grain finish. The exterior face surround is stained mahogany. The surface is coated with a number of coats of exterior quality clears. For more particulars and ideas please go to 'Engraved Timber Designs'. 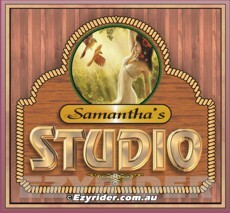 This page shows other varieties, designs & letter style choices. The cost is for labour content in producing the cedar sign. Cedar material is additional - please contact me for a current price. 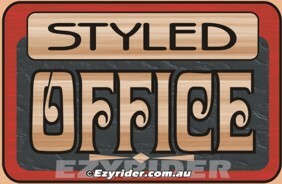 Personalise these exterior quality engraved timber office signs are with your name at the top. The name is hand signwritten in a similar style. Size 290mm x 450mm x 45mm thick. 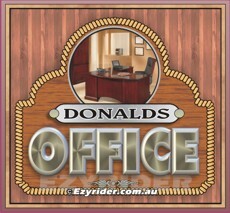 Personalise this exterior quality oval shaped engraved timber office sign is with your name at the top. The name is hand signwritten in a similar style. 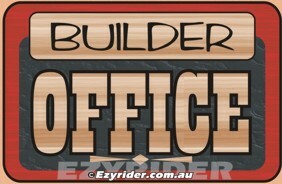 Personalise this exterior quality engraved timber office sign with your name at the top and with your picture. The name is hand signwritten in a similar style. Size 290mm x 800mm x 45mm thick. The below exterior quality signs are made on a quality exterior base. For more design ideas please go to the 'Personal Designs' web page. These 4 designs show different boarders and are within the exterior quality range. 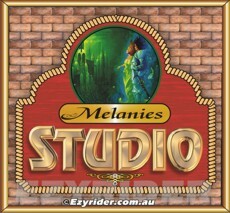 You can substitute the lettering "Studio" for "Office" and the 'name' area is your personal choice to personalise. Email your picture and I will modify/enhance to place in the picture area. Size is 650mm high x 600mm wide. Price $185.00.